Free woodworking plans for cabinets and chests. Find numerous cabinet and chest plans to help you design or build your next woodworking project. Find other free woodworking plans. 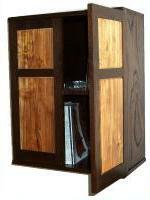 19 Free Woodworking Plans found in the "Cabinets / Chests" Category. 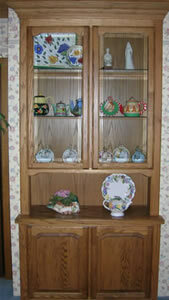 Complete your fabulous dining room with this elegant oak china cabinet. It is the perfect way to store or display your fine china and collectables. The Stackable wall unit is actually a series of projects. The first part of the project contains the plans to build the wall unit base, basic cabinet, and the cabinet with doors. The other projects will cover the plans to make a filing cabinet and a neat little desk. Don't let the clean, handsome lines of this very functional piece fool you into thinking that building it is beyond your skills. In fact, it is an excellent project choice for anyone who has had experience with only the basics of woodworking.The doors might be a little tricky, but you could always make a flat front door if you don't think you have the woodworking skills to pull it off. This free woodworking plan of a wall cabinet includes diagrams and useful text describing the contruction process. If you are like me, you've always dreamed of making your own kitchen cabinets. This plan may be the beginning of those kitchen cabinets you've always wanted to build. This handsome piece, which is inspired by the past, proves the point. Though the original served as a light-duty workbench in a Shaker community, its good looks makes this piece a welcome addition in just about any room. Use your creativity to change the top design a little and turn this project into changing table.